In any event, to celebrate the newborn Second Republic, a competition was held to find a painting that could be displayed in town halls across the country. Between 1848 and 1849, Armand Cambon created the painting above as his entry (he didn't win). 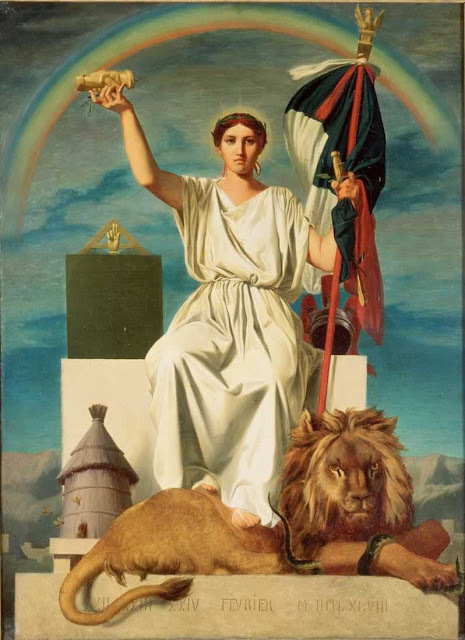 La République is a symbol-heavy allegory and many of these Republican symbols are quite obviously also Masonic. But as I've said before, half-jokingly, what symbol isn't? I feel that this is a simplification of the symbolism. I can't vouch for Cambon's intentions, but let's take the clasped hands as an example anyway. I've always read that they symbolized Fraternity and/or unity. It wouldn't be too far a stretch to assume it also hints at a new social contract between citizens. Not quite the same as the interpretation above. Of the symbols in this painting, the square, the clasped hands, the beehive and the rainbow are still regularly used in Freemasonry. The eagle might also be a not entirely implausible link as well. A double-headed eagle is used in the Scottish Rite, but more importantly, it is also the symbol of St. John the Evangelist, one of the two patron saints of Freemasonry. St. Mark, for that matter, is symbolized by a lion, and while I'm not saying the eagle represents St. John, I'm sure the lion is more a symbol of strength, dignity and leadership and is even less likely to have a connection to the evangelist. What I find interesting about this lion is that he is subduing a serpent, most likely the sneaky enemies of the Republic, which in and of itself is not so remarkable; what is striking here is that the image of a subdued serpent has a long history in Marial iconography, or what George P. Landow calls "prophetic typology"....the Virgin vanquishing Satan and Original Sin. I propose that Cambon is making a sly anti-clerical statement here, tweaking the nose of would-be counterrevolutionaries in the Church, the lion has replaced the Virgin, but this is not an air-tight case by any stretch of the imagination. Let's also look a bit more at the rainbow. Another website about Cambon's painting bluntly states: "L’arc-en-ciel est un symbole de fraternité." The rainbow is a symbol of Fraternity. So we already have two differing interpretations and I'm not sure either quite gets it right. The value of such a symbol for the French Revolution is self-explanatory. The Revolution wiped away the old to make way for a new, more lawful order. Interesting that the first interpretation of the allegory has the women as either the Republic, or the Law. The rainbow appears just after God has set before Noah a reiteration of the laws he gave Adam and Eve, having added a seventh. Sealing the deal with clasped hands? This last law is a kind of meta-law, as it calls for establishing courts of law. The Jewish Noachide Movement also uses the rainbow as a symbol, the seven colors representing these Seven Laws of Noah which are binding not just for Jews, but for all humankind. 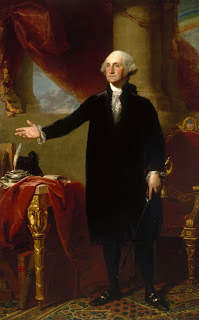 The rainbow is also featured in the famous "Lansdowne portrait" of George Washington. In this symbol-heavy piece, storm clouds are to his right while to his left a rainbow appears. Certainly the story of Noah is being evoked here to represent that the American Revolution, if not Enlightenment ideas, were leading to a "new world order" to coin a phrase, of peace and progress. The Masonic rainbow is sometimes interpreted as the Arch of Heaven, supported by the pillars of Wisdom and Strength. A rainbow appears in the ritual apron given to Washington by Marquis de Lafayette, his comrade-in-arms in the Revolutionary War. Indeed, the pillars of Wisdom and Strength (two of the seven Biblical Pillars of Wisdom) will return to our story as towers. The website in question features a detail of the rainbow ending not in a pot of Lucky Charms, but on a pillar topped by a globe in the fashion of Jachin and Boaz. A tricolored rainbow in the French and American colors arcs over a pair of clasped hads. The Masonic delta is prominent and the hemispheres in different colors, like the colors in the Noahide flag, represent 7 virtues. This order was created by Freemason Rev. W. Mark Sexson (ha ha) in 1922, based on the Order of DeMolay for boys. DeMolay also promotes 7 cardinal virtues. Could the number of these virtues be a reference to Noah's laws? Given the rainbow, it is quite possible. Another Masonic rainbow is found in the Royal Arch, an additional set of degrees in the York Rite, considered at one point to be a continuation and completion of the 3rd Degree in regular Craft Masonry (1°-3°). As a visual metaphor, the rainbow reappears in various Royal Arch contexts. Indeed, it has been shown "...showed that the Rainbow symbol formed part of an early Royal Arch ceremony..." But the tradition of associating the Rainbow and the Arch continues. It has been said that “The Royal Arch stands as the rainbow of promise in the ritual; it stands as promise of the resurrection; of that which was lost and shall be recovered.” The Royal Arch accepted the rainbow, that God put in the Heavens as a covenant between God and man, that he would not destroy the world by water again-but by fire. While Zerubbable was a "Prince of Judah" as proclaimed by Cyrus, another "Prince" was coming, a Prince of Peace. One that would establish God's kingdom in the hearts of man, causing each to be a "Temple of God." The covenant as exemplified by the rainbow, the Royal Arch of the Noahchide promise, must give way to the Royal Decree of, "This is my beloved Son. Hear ye Him!" I'm not exactly sure what that means, to be honest. I should also point out that Mackey's Encyclopedia does not contain an entry on "Rainbow". Which is actually quite surprising and leads me to wonder if perhaps I'm not making too much of the symbol's Freemasonic usage. On the other hand, it's appearance in the contexts descibed above are a legitimate connection, so I'm not exactly sure what to make of it. The proposed meanings seem contradictory and confusing. "[James] Anderson’s reference to Masons as ‘Noachidae’ was not simply harking back to an early tradition. As a ‘basis of that natural religion’ on which all Masons can agree he is here suggesting that we are those who accept the Noachite Laws as our standard." 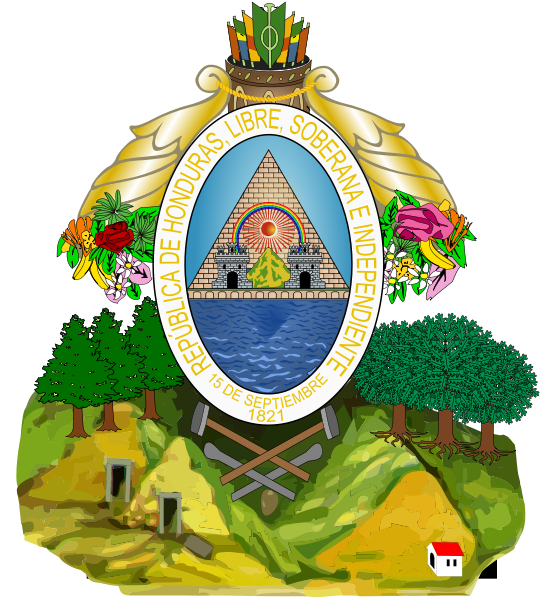 For the moment, however, I would like like to return to the following quote and look at the Honduran coat of arms. The Masonic rainbow is sometimes interpreted as the Arch of Heaven, supported by the pillars of Wisdom and Strength. The Masonic imagery in this coat of arms should be obvious: the delta, or pyramid, forms the backdrop to a radiant rising sun, which was originally a Phrygian cap--one of the most ubiquitous of symbols from the French Revolution. Spanish Wikpedia says the rainbow symbolizes peace, the unity of the Honduran family and high ideals. The triangle signifies equality before the law. The castles represent the conflict between the Aboriginal Hondurans and the Conquistadores. The rising sun symbolizes freedom, patriotism and hope. The two castles, or towers, also bring to mind those the pillars of Strength and Wisdom, aka Jachin and Boaz, which support the Arch of Heaven, or rainbow, and which would appear to be depicted in the Lansdowne portrait of Washington. The Wisdom and Strength of the Republic are essential meanings contained within Cambon's symbolic painting. The earliest of walled permanent human settlements had access gates flanked by towers for defensive and observation purposes. Since the city/city state was the most important thing in most people's eyes, these gate towers were not only defensive, they marked the entrance into an "important space." As these cities grew and other "important spaces" were incorporated within them, such as temples, etc, these spaces were also entered through doubly towered gates. The concept of 'towered entry' to important space had carried over from the symbolism of the city gate towers themselves. Pairs of large single stones frequently mark the entry to sacred space from the earliest of times. The great temples of Egypt were fronted by twin pylon towers. The gate towers of many ancient cities became works of art and symbols of civic pride. Any symbolism you may find regarding the subject would be rather recent in origin and an example of "symbol emerging from utility"rather than symbolism actually driving the original design. I think there is a lot of merit in this argument, but on an "archetypal" level, the evocation of Egyptian and (to my mind) Phoenician sacred architecture belies the "symbol emerging from utility" argument. Medieval architects were certainly aware of the appearance of Solomon's Temple, designed by a Phoenician, so it's quite possible that this symbolic heritage entered into the equation, not instead of but in addition to the process described by this author. Which brings up an important point when discussing symbolism in general; once one thing has become widely accepted to represent another, its use will multiply exponentially. Thus when we see symbols in Freemasonry repeated (or borrowed) from other contexts, we should remember this point. I'm not sure I want to make too much of these towers as a substitute for Jachin and Boaz, but I can't help but think of this idea of strength, or earthly power and wisdom, or divine insight as being both sides of the same coin. Or the same side of different coins, no matter! I also cannot help but think of the Toulouse coat of arms, surmounted by a crown composed of three towers, while the shield itself has an image of a castle and a church: earthly and spiritual authority side by side. Some have proposed that this is, in fact is the significance of two pylons or obelisks in front of Egyptian "important spaces", thus leading via Solomon's temple into Freemasonic usage. But this leads us deeper into a realm of unsubstantiated speculation. I have in fact already posted about Masonic imagery in Latin American heraldry, and towers don't figure into those images at all. We could add that the coat of arms of the United Grand Lodge of England, the closest thing to a world authority for Grand Lodge (as opposed to Grand Orient) Masonry, features a coat of arms with three towers, among other things. I wonder too, out of the blue, if this is why Mary Magdalen, whose name itself means "tower," is often pictured wearing a crown in the form of a tower, as if eartlhy might rests upon the seat of wisdom. It may also be worth examining at some point the Empire Sentinels. This was a Scouting group founded by Major David Cossgrove in New Zealand circa 1910; Sentinels were organized into “Towers” and the scheme had three degrees based on religious duty, patriotism, sacrifice and work, each with a corresponding “Watch,” or ritual. The watchtower is an important symbol in the ritual and organization. It was also influenced by Masonry, which is reflected quite clearly in it's rituals. Watchtowers are also an important feature of Enochian magic. Enoch is the seventh of ten antediluvian patriarchs and is also usually referred to as an "ancestor" (great-grandfather) of....Noah.